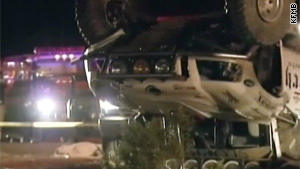 A truck taking part in a 200-mile race crashed in Southern California last week, killing eight. Los Angeles, California (CNN) -- Federal officials Thursday barred the promoters of last week's deadly off-road race in Southern California from holding future races on public land while an investigation is under way. Saturday night's crash in the desert east of Los Angeles left eight people dead and nine injured when a truck taking part in the 200-mile event crashed into a crowd of spectators along the track. The driver won't face charges in the accident, the California Highway Patrol announced Monday, but the federal Bureau of Land Management is investigating whether sanctioning body Mojave Desert Racing violated any safety regulations. According to its permit, Mojave Desert Racing had five more races scheduled for 2010. The company has not responded to repeated calls for comment since Saturday's fatal crash. "BLM has suspended any future permitted events of MDR Productions while the investigation is underway," the agency announced Thursday. In addition, another promoter's upcoming motorcycle race is under new scrutiny, and future events "are being reviewed on a case-by-case basis," BLM said in a written statement. The agency said that off-highway races are a popular activity and that its investigation "will be aimed at ensuring the public safety remains our first priority." Last weekend's race was part of an amateur series on a course in the Lucerne Valley area of San Bernardino County, east of Los Angeles. Mojave Desert Racing urges spectators to stay back 100 feet from the 50-mile course, but a California Highway Patrol spokesman said there were "no delineations" for the course. Images from the night of the crash show trucks speeding within feet of spectators. Brett Sloppy, the driver of the out-of-control truck, did not respond to repeated requests for comment but announced in a post on his Facebook page that he was devastated by what happened. "My thoughts and prayers go out to all the familys and friends involved," he wrote. "Thank you too all my friends for sticking with me even thru these tragic times I love you all." Keith Carty, a friend of one of the victims in the California crash, told CNN's HLN that races attract a certain type of person: someone who wants to participate as much as watch an event. "It's not anybody's turn to baby-sit us. We're out there. We understand the risk. Everybody that was there understood the risk: the drivers, the spectators, everybody," he said. CNN's Stan Wilson contributed to this report.